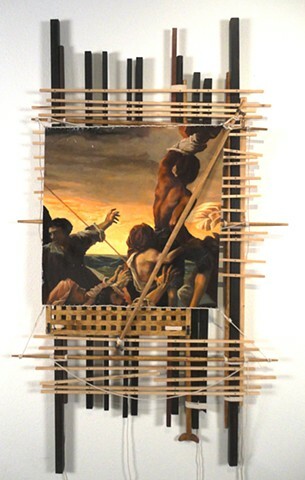 46" x 26" x 5"
This piece evokes the dramatic painting Raft of the Medusa by Theodore Gericault. The French frigate Medusa foundered off the coast of Mauritania in 1816. Of the crew, 147 abandoned the ship in a make-shift raft. Only 15 survived. Gericault did extensive research on the tragedy; interviewing survivors, building a model of the raft,and undertaking numerous studies.